six × 3 = Required Please enter the correct value. We just received one of the biggest China stock market crash warning signs today (Tuesday) when the country announced economic growth in 2015 slowed to 6.9%. That was the slowest growth rate in 25 years and below economists' lowered expectations of 7%. Meanwhile, Q4 2015 GDP growth came in at 6.8%. That marked the weakest quarterly expansion since 2009, when we were in the depths of the financial crisis. Still, the GDP number was in line with analyst expectations. Data from China's National Bureau of Statistics showed manufacturing growth slowed to 6% in 2015 from 7.3% in 2014. Industrial production grew by 5.9% in December. That was shy of forecasts for 6% and down from November's read of 6.2%. Retail sales also came in short, with an annual rate of 11.1%. Expectations were for an increase of 11.3%. It was the first month since July 2015 that the annual rate was slower than the month before. Urban fixed-asset investment decelerated to an annual pace of 10%, down from November's 10.2% pace. The figure marks the slowest annual increase since the early 2000s. Forecasts for 2016 annual GDP call for a growth rate of 6.5%. But to get there, another interest rate cut, several reserve requirement ratio cuts, and fresh fiscal monetary measures are expected. China cut interest rates six times in 2015, and lowered reserve requirements several times. By making loans cheaper, China is aiming to encourage companies to spend and invest. The extra loans might spur more construction of apartment buildings, office towers, and shopping malls. With mounting debt and too much housing and factory capacity, economists and Chinese officials anticipate a tougher year ahead. Debt, which has continued to rise even as the economy slows, has limited Beijing's options to boost growth. State-owned enterprises' profits fell 9.5% year over year during the first 11 months of 2015. Meanwhile, their debt increased 18.2%, according to BMI Research. Total debt in China currently equals almost 260% of annual economic output, according to UBS Group. That's up from less than 160% in 2007. 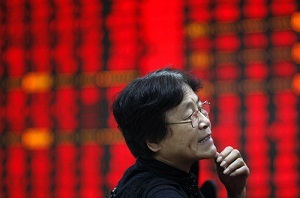 Despite the dismal numbers, China's Shanghai Composite rose 3.22% Tuesday. But the index is down 15.96% year to date and continues to have global markets on edge. Investors should keep a close eye on the Shanghai Composite Wednesday morning after analysts have had more time to digest the figures. Any major drop in the index could be another sign of an upcoming China stock market crash.